UNL is expanding its innovative defense-related research through the National Strategic Research Institute at the University of Nebraska, one of only 13 U.S. Department of Defense-sponsored University Affiliated Research Centers in the nation. NSRI-funded projects like engineer Dennis Alexander’s laser surfacing of metals have put UNL research on the radar of NSRI’s sponsor, the U.S. Strategic Command. 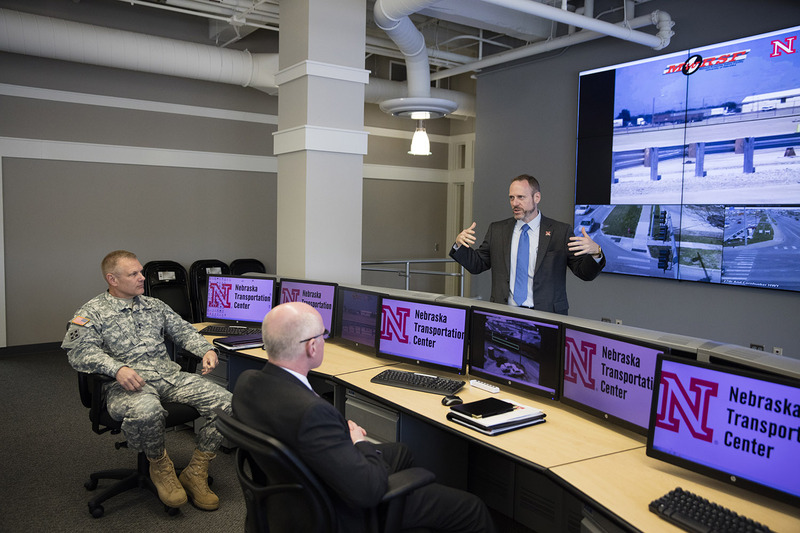 USSTRATCOM executives learned about UNL research with potential defense applications and explored potential areas of collaboration during an April 2016 campus visit. Tours of the Extreme Light Laboratory, Holland Computing Center, Center for Brain, Biology and Behavior and the Nebraska Athletics Performance Laboratory and presentations by faculty from business, computer science, transportation, engineering, physics and food microbiology provided an overview of UNL’s capabilities. Three areas of potential UNL-USSTRATCOM collaboration grew from the visit: developing innovative leadership education and training programs through UNL’s Don Clifton Strengths Institute to meet USSTRATCOM’s workforce development needs; researching security against cyber threats with UNL computer scientists; and creating simulations with UNL engineers to detect and disrupt proliferation of nuclear weapons.